Unless you have been living under a rock, you are probably more than aware that very shortly, we we will be seeing an all female led Ghostbusters reboot on the big screen. Even if you were living under a rock, it has been hard to avoid just how negatively this reboot of the beloved franchise has been received prior to the film even being released. Star of the film Melissa McCarthy finally addressed some of that negativity. 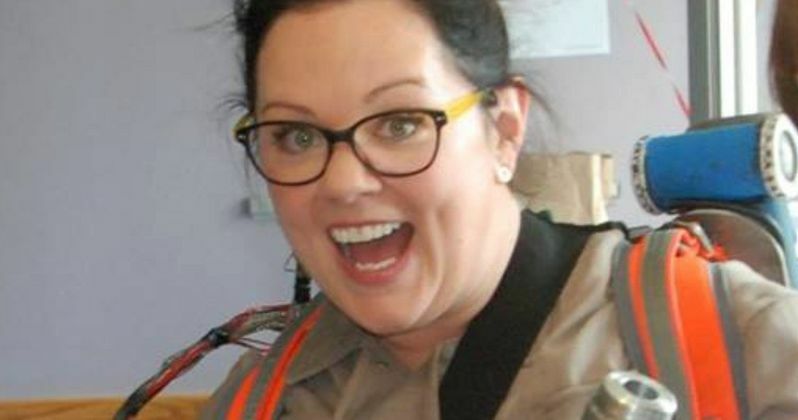 McCarthy is one of the four female leads of the new Ghostbusters film alongside Kristen Wigg, Kate McKinnon and Leslie Jones and hasn't yet spoke much about all of the negative comments that are plastered all over the internet about the reboot. In a recent inteview with The Guardian, McCarthy addressed the negative comments, saying she hopes they find a "friend." Here is what she had to say when the topic came up. "All those comments - 'You're ruining my childhood!' I mean, really...Four women doing any movie on earth will destroy your childhood? I have a visual of those people not having a [my husband] Ben, not having friends, so they're just sitting there and spewing hate into this fake world of the internet. I just hope they find a friend." Internet comment sections are a well known breeding ground for negativity, but from the very start what has been thrown at the Paul Feig directed reboot of Ghostbusters has been downright aggressive. Initially, quite a few people were upset that it would be women taking on the iconic roles, which sparked a lively sexism debate that is still raging on. Feig has also taken time to address the issue, seeming very distraught over how ugly some of the fan base has become on the matter. "The first wave when you make an announcement like that is overwhelmingly positive. Everyone's so happy and you're like, this is great. Then comes the second wave and you're like, Oh my God. Some of the most vile, misogynistic sh** I've ever seen in my life." Outside of the potential sexism, nearly every bit of footage that has been shown for the new Ghostbusters has been ripped to shreds on social media and in comment sections. The first trailer for the film went on to become the single most disliked movie trailer in the history of YouTube, just to give an idea. Granted, many felt that the poor quality of the first trailer had nothing to do with the cast being led by females, who are generally very funny. Especially in the case of McCarthy, who has worked with Feig several times in the past on Bridesmaids and most recently on Spy, which was one of the pleasant surprises of 2015. There is no doubt that all of the negativity surrounding Ghostbusters will have some effect on i when it finally comes out on July 22, but just how much remains to be seen. McCarthy and Feig certainly are coming from a seemingly reasonable place as creators being confused by just how uproarious and severe the outcry has been. Either way, Sony has big plans for Ghostbusters in the future, and we won't really know how this will all play out until the film actually drops and the reviews come in.